Last Thursday morning 5:30 rolled around pretty damn early, but I managed to drag myself out of bed to hop into a rented minivan with my buddy, rare-book dealer Nick Certo, and drive down to Trenton, New Jersey. We had agreed to meet friends and fellow pulp collectors Walker Martin and Digges La Touche at the former’s home, from which we would begin the long drive to Columbus, Ohio, for the seventh annual PulpFest. We hit Trenton shortly before 7:30 and were zooming our way westward a few minutes later. I do most if not all the driving on these excursions, and although Walker (who habitually takes the front passenger seat) white-knuckles it for the duration of each trip, I’ve never lost a passenger yet. Not that I haven’t been tempted a few times. Generally, though, I consider these long drives part of the fun. There’s always plenty of good-natured banter and it’s fun to hear Walker and Digges wax nostalgic—as they invariably do—about the early Pulpcons and the great bargains they scored in years past. We ran into some construction-related delays but arrived at the Hyatt Regency around 5 p.m., by which time dealer set-up was already underway. Early-bird shoppers were admitted to the huckster room at 6, and it was a good thing I had the Murania Press table laid out on time: I sold several hundred dollars worth of merchandise in just a few hours. PulpFest is known for its extensive and meritorious programming, and even though the convention doesn’t officially begin until Friday morning the committee decided several years ago to offer a full slate of Thursday-night programming as an accommodation to early arrivals looking for something to do. The dealer-room action prevented me from attending two panels I very much wanted to see: one with John Wooley and John Gunnison on the “Thrilling Group” detective pulps, the other with Anthony Tollin, Will Murray, and Michelle Nolan celebrating the 75th anniversary of Street & Smith’s entry into the comic-book field with Shadow Comics. I was scheduled to do a 10 pm presentation on the “Thrilling” Western pulps. I’d packed a CD with cover scans before going to bed Wednesday night but had neglected to include my notes, left on my desk and forgotten when I awoke groggily and staggered out of the house the next morning. What’s more, I was exhausted from the long drive. But the presentation seemed to come off pretty well—even though I hardly knew what I was saying—and Michelle Nolan subsequently assured me that, amazingly, I hadn’t made any factual errors. Friday morning found my friends and I waking up early and scarfing down breakfast at a nearby eatery we discovered during PulpFest’s first year at the Hyatt. (This was the fourth.) Then it was back to the huckster room, which opened to dealers at 9 a.m. and to the public an hour later. Business was pretty brisk. I had the new issue of Blood ‘n’ Thunder on hand, so between distributing copies to subscribers in attendance and making sales to other con-goers I watched two stacks of the zine dwindle rapidly. My supply of back issues also was depleted gradually, and I sold a few pulps and books as well. The crowd, while not appearing to be record-breaking in size, seemed enthusiastic and willing to spend money. A number of my regular customers had to skip this year’s PulpFest, though, and their absence had a deleterious effect on my bottom line. As usual, afternoon programming slots were commandeered by New Pulp authors who read selections from recent works. Scheduled for these events were Jason Scott Aiken, John Hegenberger, Duane Spurlock, and Scott Urban. Unfortunately, I always miss the afternoon readings because I’m manning the Murania Press table, taking periodic breaks to shop around the room. The rarest, most impressive item in the dealer room was a copy of the August 1913 issue of Street & Smith’s New Story Magazine. 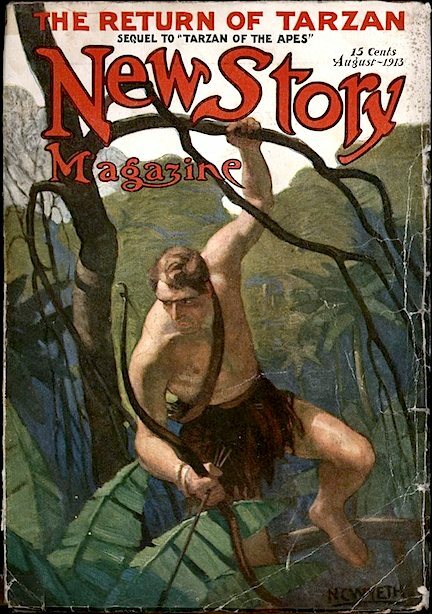 This number begins the serialization of “The Return of Tarzan,” second of Edgar Rice Burroughs’ stories featuring the immortal Ape Man, and sports a Tarzan cover by legendary illustrator N. C. Wyeth. Doug Ellis, chairman of the Windy City Pulp and Paper Convention, snapped up this beauty, which is pictured below. The purchase price was $1,900. It’s a fabulous addition to what is already a world-class collection and Doug rates congratulations for getting it. After dinner I joined Will Murray and Philip M. Sherman in a panel discussion covering Thrilling Group editorial director Leo Margulies, “the Little Giant of the Pulps.” Phil, who was Leo’s nephew, brought his personal insights into the man as well as a fascinating selection of rare family photos presented in a slide show. I thought the panel came off pretty well and most people seemed to agree. PulpFest committee member Mike Chomko called it one of the highlights of the weekend. I wanted very much to see the rest of the evening’s programs but exhaustion had caught up with me and I went up to my room at 8 p.m. hoping to get a good night’s rest. Tired as I was, though, I did more tossing and turning than sleeping. So I missed brief presentations by special guests Chet Williamson and Weird Tales artist Jon Arfstrom, along with several panels. Regular Blood ‘n’ Thunder contributors were well represented on Friday night: Tom Krabacher, Rick Lai, and Nathan Madison joined John Haefele and Don Herron for a discussion of H. P. Lovecraft’s Cthulhu Mythos, while Will Murray and Garyn G. Roberts teamed with Michelle Nolan to offer a brief history of the comic books issued by Thrilling Group publisher Ned Pines. A pretty impressive Friday night, don’t you think? Saturday saw the arrival of many walk-ins who, presumably, couldn’t make the Friday session because they were at work. But it seemed to me that sales trailed off nonetheless, and all day Saturday I didn’t do as much as business as I had in a few hours during the Thursday-night set-up. The afternoon programming session found New Pulp author Ron Fortier moderating a discussion covering “The Heirs of Weird Tales” and a presentation on one of the Unique Magazine’s top illustrators, Lee Brown Coye. That evening Tom Krabacher led a panel including Don Herron, Morgan Holmes, Will Murray, and Garyn Roberts. The topic: editing Weird Tales. I especially enjoyed “The Thrilling Adventures of Rudolph Belarski,” a biography and career story put forth by pulp-art historian and BnT contributor David Saunders, whose father Norman was one of the industry’s giants. David, a warm and gregarious guy in person, affects an air of diffidence when making his PulpFest presentations, but his command of the subject is such that one isn’t taken aback by his low-key manner. The Belarski family photos were interesting and David chose some wonderful covers to demonstrate Rudy’s proficiency. Following the presentation of 2015’s Munsey Award to long-time pulp historian and collector Steve Miller, Adventure House’s John Gunnison took up his gavel yet again to conduct a PulpFest auction. This year he got off easy; there were only 81 lots, and anything that didn’t elicit a $20 opening bid was passed upon. Past PulpFest auctions haven’t always featured desirable material, but this year’s offerings included some nice items that sold for reasonable prices. I bid on several lots and would have won at least two had I not been so conservative. Sunday is typically a nothing-burger of a day. The convention advertises dealer-room hours as 10 a.m. to 2 p.m., but most hucksters begin packing up as soon as the doors open in the interest of making a fast getaway. By noon the whole room begins closing up and people start saying goodbye. That’s always the most depressing part of the weekend. PulpFest chairman Jack Cullers on Sunday told me that total attendance was “between 450 and 500.” I found that hard to believe; my own guess would have been 300 to 350. Later Jack revised the figure downward to “about 420,” but I’m still skeptical. Not that it really matters; by my lights the show seemed extremely well organized and executed. I quit the committee last year but could tell that a lot of time and energy had been expended on the 2015 PulpFest. Since we have a long drive back to New Jersey, my little group has made a tradition of staying an extra night at the Hyatt and enjoying a leisurely Sunday dinner that doubles as a post-mortem of the show. The general consensus was that this year’s PulpFest was every bit as much fun as the previous six. Kudos to Jack Cullers, Mike Chomko, Chuck Welch, Barry Traylor, and their family members who pitched in to make last weekend a memorable one. Concerning NEW STORY, Doug Ellis sent me an email saying the correct price paid was $1900. I don’t know how in the name of Cthulhu the rumor started about the price being $4000. The highlight of the show for me was the appearance of WEIRD TALES artist Jon Arfstrom. He may be the last of the old WEIRD TALES group. I’m already preparing for the next Pulpfest. Dates are July 21-24, 2016. Thanks for the updated info, Walker. I’m going to make the correction in my report immediately. Thanks for the report Ed, excellent job as usual. I was stuck in the Hyatt food court for breakfast Friday and Saturday with the anime fans. They were entertaining. One took down a large display at the Velvet Cafe when her costume snagged on it, sending pieces crashing in all directions. Thanks for your kind words, Ed. As you know from your years on the organizing committee, the convention is a lot of work to mount. But when people have a good time, that makes all the hard work worth the while.